Leftover Easter candy for the win! I love coconut & chocolate, so Mads was definitely on a roll here. 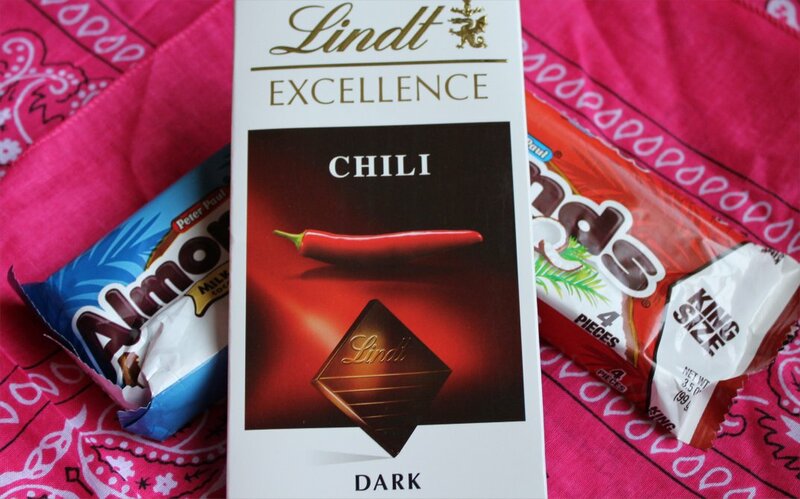 And the dark chocolate chili by Lindt is a favorite. Our friends Kaki & Donny introduced us to it with the recommendation that it pairs beautifully with red wine… which we just happen to have in the pantry. How convenient! It’s like she was reading my mind. Sometimes you feel like a nut. 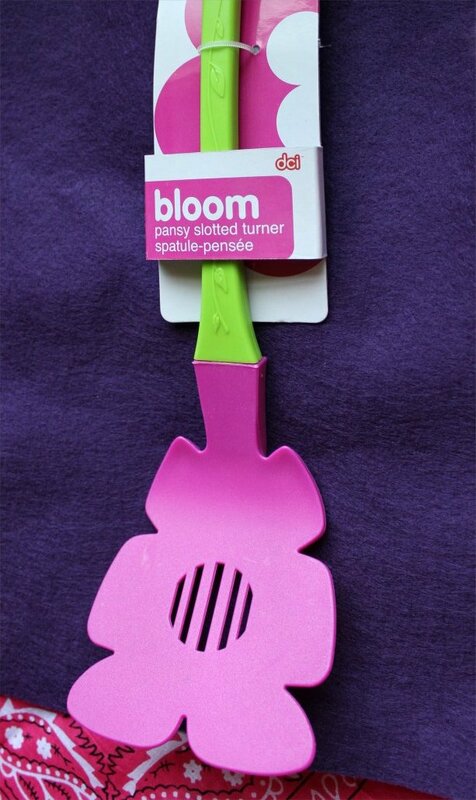 Y’all, it’s a flower spatula! 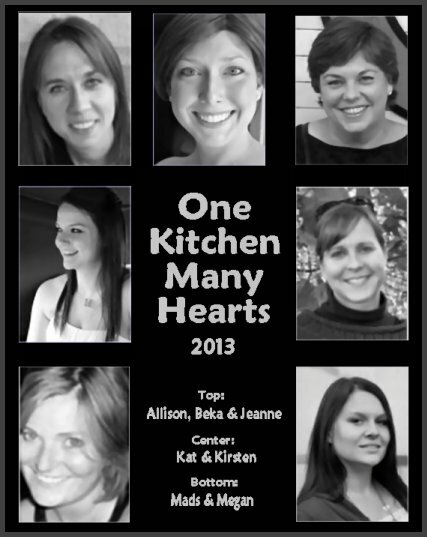 As a lover of all things Kitchen Gadgety, this was awesome. It’s long enough to flip things on the grill. I can’t wait to make The Complete Package use it for burgers! We’ll have to see if he can channel his inner diva enough to take it outside where other male neighbors might see him. If not, it’s also perfect for pancakes and cookies. So springy! Next up, Mitts & Paws – because nothing says “I’m ready to take off my flannel PJ’s and get outside” like a mani/pedi. I love this vibrant hot pink. And it came with foam spacers (for accident free piggies) and a sparkly glitter nail file. How spectacularly girly, Mads! After a few months of running the heater in Houston, my skin is crying “yessss!” Madelyn says she hoards this body butter and now I know why. Haven’t tried it yet? You need to. Your hands will thank you. Your shins will thank you. Your crusty elbows will thank you. Your significant other will thank you. Lastly, Mads included something that said in the most gentle of ways “You’ve scarred me for life.” It made me laugh out loud (the items, not the scarring). It’s a bag of leftover craft supplies from The Mouse Project when my OKMH buddies crafted 50 felt mice to celebrate my 50th birthday. It was a hoot for me because it was based on my felt mouse tutorial, but mildly traumatic for those who, in their own words, were not born to craft. To see their glorious creations, you can click here. It was Madelyn’s note that made me laugh out loud. Those feathers! They are too much. And the glittery sunglasses – so fun! Yes, Mads. I will put it all to good use. There’s no telling whose OKMH box they may make it into next. So many potential victims, so little time. 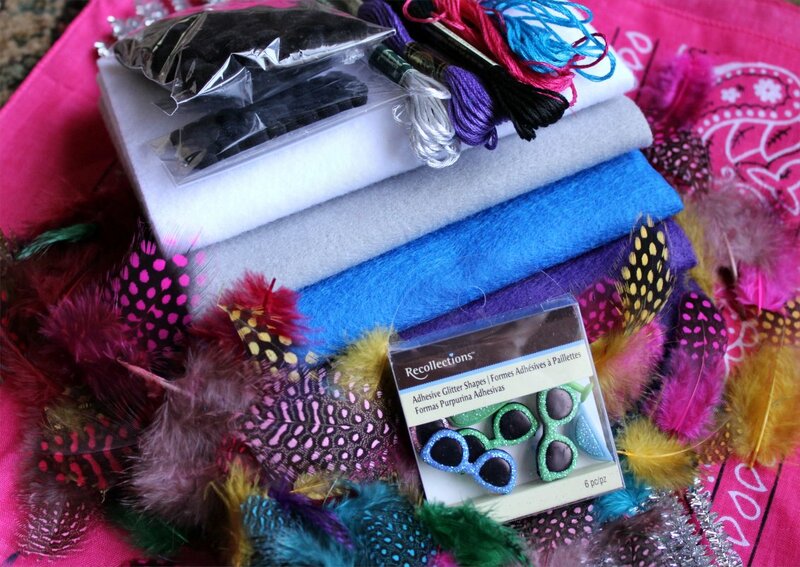 Speaking of victims, my April Spring Fling box went to Kat at Tenaciously Yours. To see what I sent, CLICK HERE. To be honest, I love getting these boxes but I love giving them even more. I think most if not all of the girls in our group feel the same way. We have so much fun collecting the perfect items to send in each box, hoarding cute things like squirrels until it’s time to ship. Or canning homemade goodies. Or tackling handmade crafts. There’s so much squee-ing. 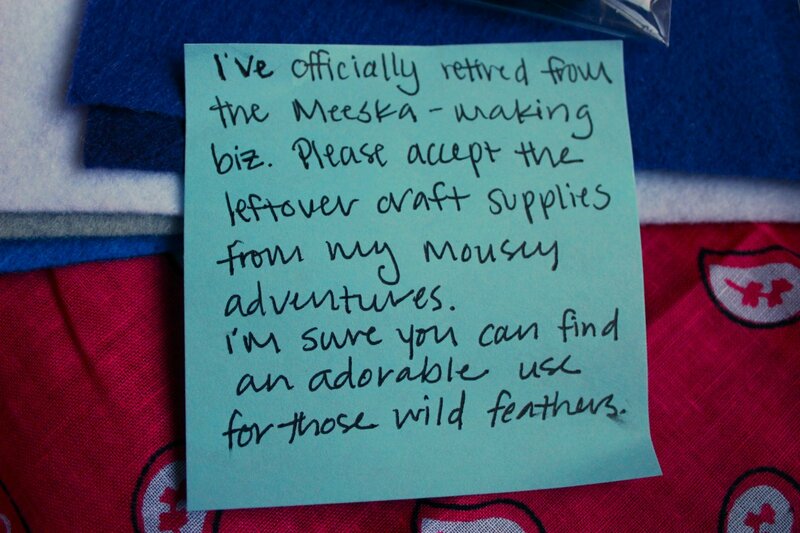 Sending the leftover mouse supplies is absolutely hilarious! I hope Mads made a squeaky mouse for Josie pug before retiring. 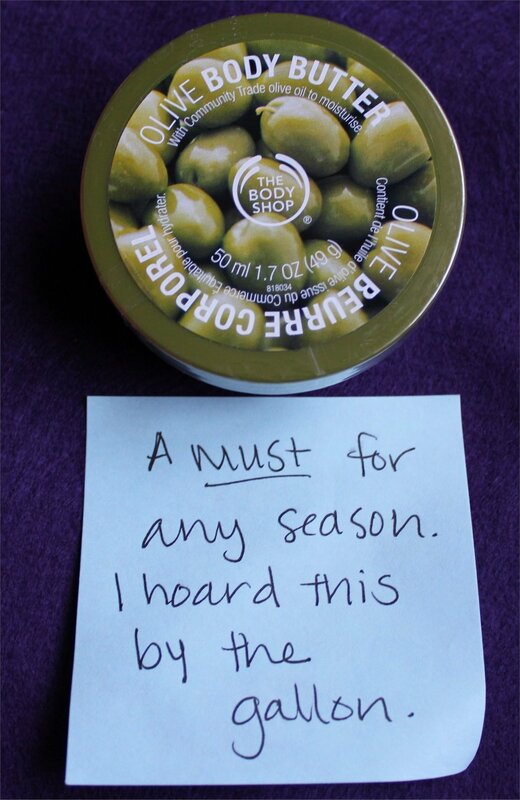 I’ll be on the hunt for that body butter! Totally cracked up at the mousing supplies – I am imagining you madly creating more members of your mouse army while noshing on the chocolate. WHat IS it about coconut and chocolate that makes it so delicious together? LOL about the leftover supplies–those would be my thoughts exactly. I am NOT a crafter! I haven’t tried the body butter in olive oil, but I could EAT the mango one. Yikes. I just love seeing all the great things you ladies send each other! What an amazing, feel good idea! I must say “The Meece” have just completely stolen my heart! They are just OMG sooooo cute! Wish I could craft to save my life, but my stuff always turns out like the “Don”t” picture! I just couldn’t subject a poor little meece to looking like that for life! LOL! Several of the girls claimed to be non-crafters, but all of their mice were adorable. Join forces with us, Deb. Help us take over the world – one cute felt mouse at a time. It is our evil but glorious plan for world peace. Okay, the mouse remains easily gave me the biggest laugh of all of the boxes this time around Jeanne. So many feathers! Maybe a showgirl mouse is in order? Marie is happily nested up here at home in the kitchen surveying her realm. Thank you again for the wonderful box of treasures from Texas. Even though we are so many miles apart, it always feels like you are just around the corner. My thoughts exactly, Kat. I’m thinking Mads needs a mouse in her box. I’m also thinking her name is Lola and she’s a showgirl. I’m so happy you loved your box. I know I thoroughly enjoyed putting it together for you. Happy Spring!